Children enjoy dressing up and re-enacting their favorite storybook characters any time of the year. Halloween can be an especially imaginative time because children can dress up like the things they may fear the most, such as witches and trolls. You can make face paint at home from liquid tempera to help your child express his creativity and have a memorable night. Measure the flour into a saucepan and slowly add water. Use a wooden spoon to continuously stir and keep the mixture from clumping. Place the mixture on the stove on low heat. Continue stirring, and add water as needed to thin the flour mixture and keep the consistency uniform. Remove the flour mixture from the heat and pour it into 3 or 4 small bowls. Add 2 to 3 tablespoons of liquid tempera paint to each bowel in the colors you desire. Stir each mixture until it is smooth and has an even texture. If the paint mixture is too thin, add a small amount of flour or cornstarch to it. If the paint is too thick, stir in a few drops of water at a time. Finish each face-paint color by adding a few drops of liquid starch to make it a matte, opaque face-paint color. Alternatively add a few drops of liquid detergent to make it a glossy, slightly transparent color. However, these are not needed. 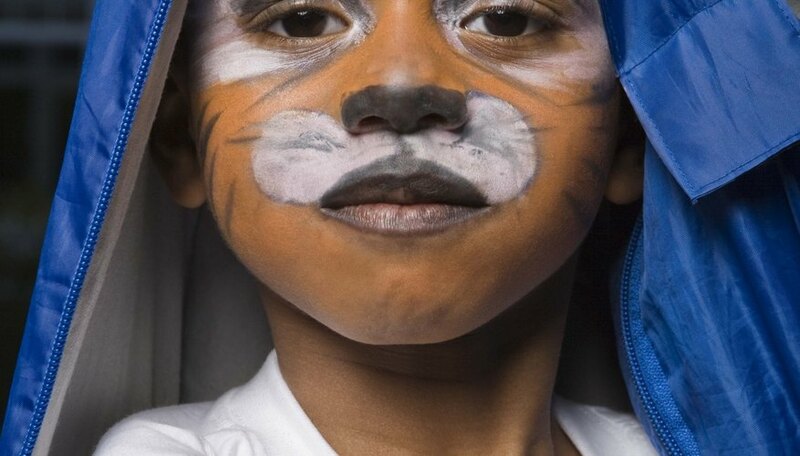 Make additional face-paint colors as needed using different tempera colors. Tempera is also available in powder form, which requires adding water to it to make it liquid. Before using the face paint, wash the face to make sure the skin is clean. Apply thin layers of paint and allow it to dry between colors to avoid mixing. Check the ingredients on the tempera paint to ensure that it does not contain anything that may cause an allergic reaction for you or your child. Do not use face paint on infants or toddlers, because they may lick or eat the paint. You do not have to add the liquid starch or liquid detergent to the face paint if you do not wish to. They should not be used on sensitive skin.